The heatwave of early summer 2015 led many people to liken their local surroundings to a tropical jungle but we all know that there is one thing about the British weather, it never lasts. This is the opposite of what couples are hoping for from their marriage, their wedding day will hopefully be the first day of the rest of their lives together in happy union. This means that you can’t really draw too many comparisons between a wedding day and the British weather but for many couples, the notion of a tropical jungle may loom large for them. 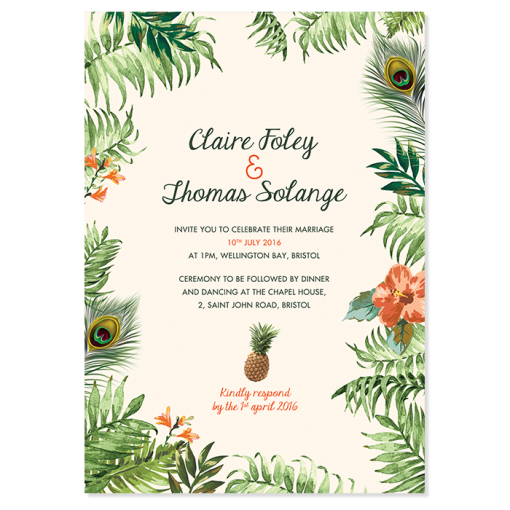 Whether this symbolises where they are heading off on their honeymoon, a shared passion of the bride and groom or they are just on the lookout for a wedding invitation that is quirky, colourful and unique to them, the Tropical Jungle invitation by Pepper & Joy will stand out from the crowd. If you know that your friends and family members have a number of weddings to attend, you want to make sure that yours is the one that stands out. The Tropical Jungle invitation will make sure that your big day is the one that people remember. Leaves and flowers provide a green and stylish border to the invitation, drawing all eyes into the centre for the all-important information. The surprise inclusion of a pineapple adds a sweet finish to an invitation to what is sure to be a sweet day. The reverse of the card is fully covered with the border design of the front, offering up a keepsake to your guests. The card can be fully customised with all of your information and there is a range of additional stationery items if you are looking to create a portfolio of notes around your wedding.